10/9/2009–Burlington, NC– The build up was tremendous and the event delivered. On Saturday, October 3rd, from all over the state of North Carolina squadrons came. Some slept at Wing headquarters the night before, some got up at 4 AM to make it there in time, but they came just the same. There were units from the coast, including Cape Fear Composite Squadron all the way to the mountains with Boone Composite Squadron. All in all 12 squadrons were represented with 85 cadets and 25 senior members. Events were set up to maximize the facilities in Burlington, and the weather even cooperated. There were “O” rides for cadets with 6 aircraft and 12 pilots ready to fly. A total of 30 cadets went flying throughout the day, most for their first flight in a CAP plane. 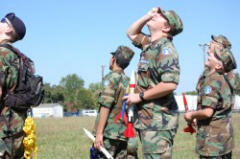 At the fairgrounds, 4 launch stations meant that most cadets did not have to wait long to get their rockets in the air. Major James Williams and Capt. Paul Twiddy with the assistance of 1st Lt. Ed Cook and Maj. Dan Wishnietsky provided cadets with expert assistance at the launch pads. After lunch, the rocket launches continued, but many cadets stayed at Wing Headquarters to play aerospace jeopardy with Major Starr as the emcee. There were also opportunities to build rockets and to take any of the exams leading to the rocketry badge. Awards were given to cadets for the Titan rocket that flew the highest and had the shortest recovery distance. C/SSgt Aleasha North from Burlington won for distance with a flight of 149 ½ meters. C/Amn Daniel Edge from Cape Fear recovered his rocket at 0 meters as it hit the launch pad on its way back! A good number of cadets earned certificates for completing the Titan phase of the rocketry program. The fight line at the Burlington airport was run by Lt. Col Al Therriault. Many opportunities for training were offered and all planes took off and landed without incident. The final O-ride of the day had a few minutes of excitement when they taxied in by the U2 band’s plane in Charlotte. One of the cadets reported that he got to see Bono, but that his pilot would not let him run up and introduce himself. According to reports there was a tremendous amount of security and police on hand, so adhering to NC Wing’s policy of “Safety First,” it would seem to be that the pilot made a good call. NC Wing had a very successful 2009 AE Day with more cadets attending than have been seen at any event since encampment. Thank you to all of the senior members who made this exciting day possible; and thank you to the cadets who have been so hard at work building rockets and studying! Keep working on those rockets, only 350 some days left until we have AE day 2010.